NORFOLK, Va. – Wisconsin Rep. Paul Ryan, the newly appointed running mate for presumptive Republican nominee Mitt Romney, on Saturday stressed that his background in Congress will work to Romney's benefit. “I believe my record of getting things done in Congress will be a very helpful complement to Governor Romney’s executive and private sector success outside Washington. I have worked closely with Republicans as well as Democrats to advance an agenda of economic growth, fiscal discipline, and job creation,” Ryan will tell the audience of more than 1,000 who came to see the announcement of his selection, according to advanced remarks released by the campaign. Ryan, who was announced as Romney’s running mate early Saturday morning, is best known for his work as the chairman of the House Budget Committee, where he authored a controversial budget that makes steep cuts to taxes, spending and entitlements. Though the budget passed the House in 2011 with the backing of 235 of the chamber’s 239 Republicans, every single Democratic opposed it. His budget already has played a dominant role in several House special-election races, most notably a contest in which Democrat Kathy Hochul scored a stunning upset in New York's GOP-dominated 26th District. The 42-year-old congressman also sought to portray himself as a politician who represents a broad cross-section of America. He urged supporters not to accept weak economic growth, blaming President Obama for failed policies. He will describe Romney as the leader with the necessary skills, background and character needed to fix the economy. 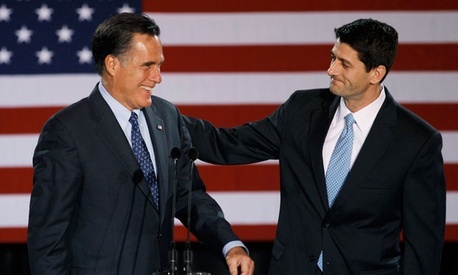 The selection of Ryan came despite considerable speculation that Romney would select Ohio Sen. Rob Portman, a veteran of George W. Bush's White House. Portman issued a statement calling Ryan's selection "a great choice. He is an accomplished public servant and a leading voice on the most pressing issues facing our country."